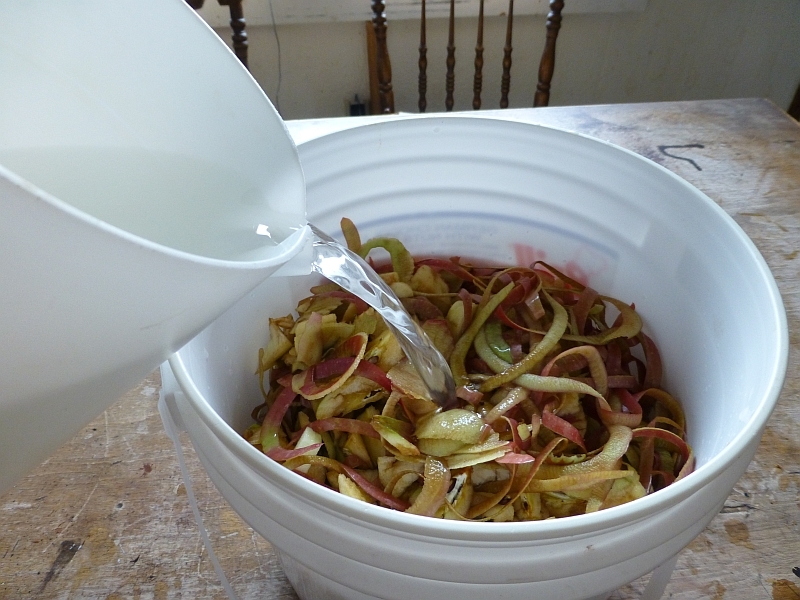 Last fall, I embarked on a new experiment: making vinegar from fruit scraps. The reason I didn't blog about it at the time was (a) it's a long drawn-out process, not a single-day project, so I couldn't really blog about it until I was finished; and (b) I had in mind an article for Backwoods Home Magazine so I didn't want to spill the beans ahead of time. My editor at the magazine has given me the green light on the article (which I submitted today), so these photos will allow her to choose which ones she wants to illustrate the article. Some of the photos are near-duplicates (same shot, different angles, etc.) so she can choose which ones she likes best. Fruit scrap vinegar is just that -- vinegar made from fruit scraps. It's an excellent way to make something useful out of what would otherwise end up on the compost pile. 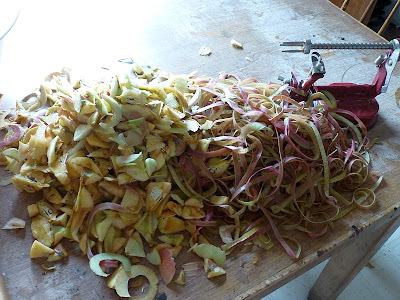 I got this notion after a long day of canning apples when I had a big pile of peels and cores and bruised fruit pieces left over. At first I was just going to toss them all on the compost pile, but somewhere in the back of my mind I had heard about making fruit vinegar, so I decided to give it a try. Actually I first got the notion of making fruit vinegar after canning 125 lbs. of peaches, but unfortunately not until after I'd thrown all those scraps onto the compost pile (what a waste!). 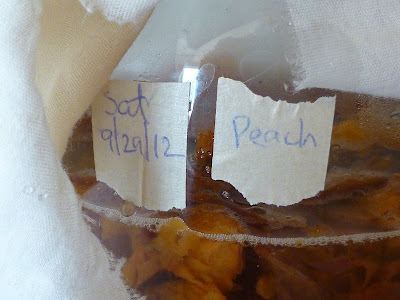 I had to settle with making peach vinegar from a small amount of peach peels we saved from eating fresh fruit. Anyway, back to apples. I put the scraps into a plastic food-grade bakery bucket. ...and the sugar that I mixed in. 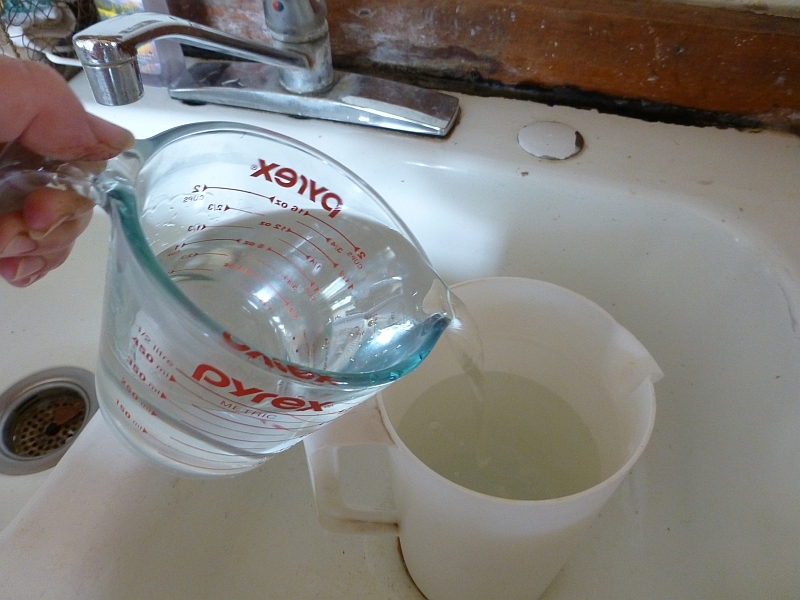 The ratio is one quart water: 1/4 cup sugar (or one gallon water:1 cup sugar). Then I poured the sugar water over the apple scraps. ...and secured it with a large rubber band. Then I put the buckets on the floor in the kitchen and let them sit for several weeks. 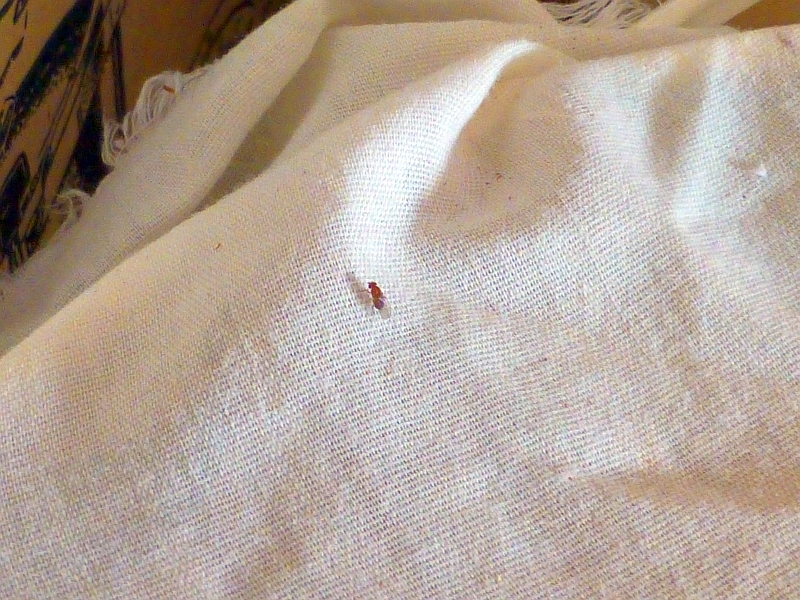 The cloth kept out fruit flies, among other things. 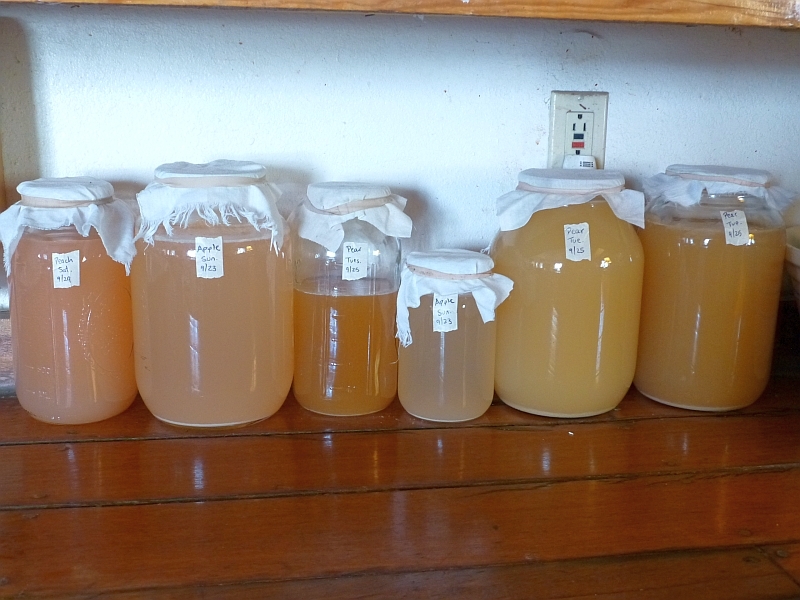 This is the fermentation stage, the first stage for making vinegar. You can tell the fermentation is happening because little bubbles of carbon dioxide form and pop. I could sit in a chair and hear the bubbles quietly popping from several feet away. I made a smaller batch of fruit vinegar from peach peels using a gallon jar. Since I was making several different types of vinegars, I labeled and dated each type. 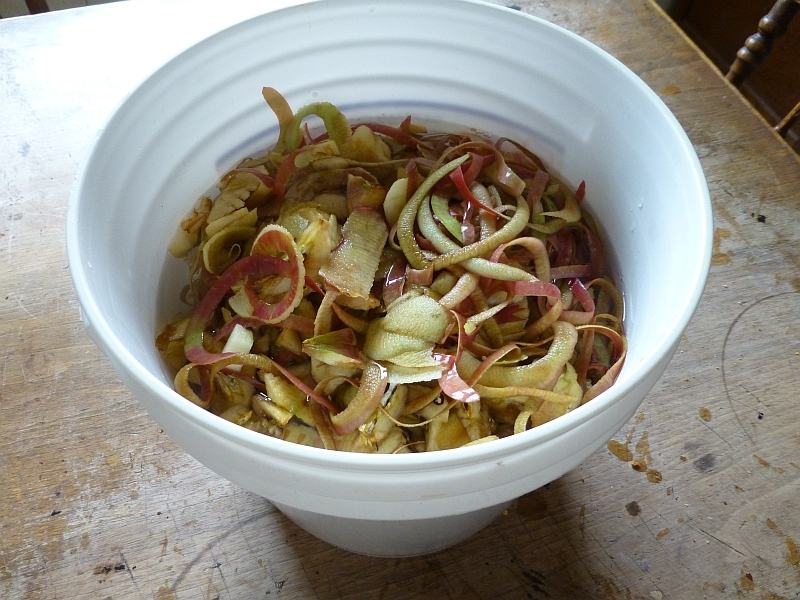 Here are the apple scraps after two weeks of fermentation. Now it was time for the second stage, the acidification. ...and saved the fermented juice. Before letting the juice acidify, I strained it one more time, through a cloth. Energized by all this frugal recycling of scraps, I decided to also make vinegar out of the massive amounts of fruit waste left over from canning pears. Here are the pear scraps after two weeks of fermentation. I didn't add enough sugar water at the beginning of this process, so the fruit, while moist and fermented, didn't have a lot of spare juice for draining. There was so little juice that it didn't really "drain" with a colander. 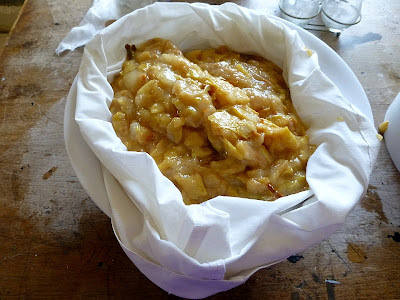 When that didn't work, I divvied up the pear scraps into two pillowcases and suspended them in the kitchen over a bowl overnight. That worked better. 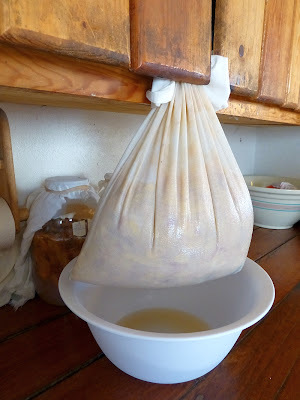 When draining fermented fruit scraps, the operative word is patience. You can't really hurry it along by squeezing. Believe me, I tried. 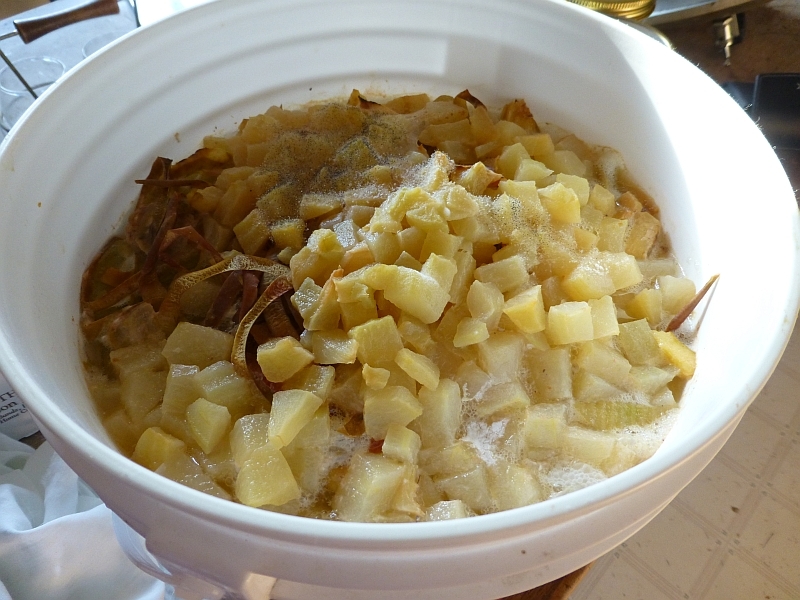 After the pear scraps drained overnight, I strained the juice through a clean cloth once more. 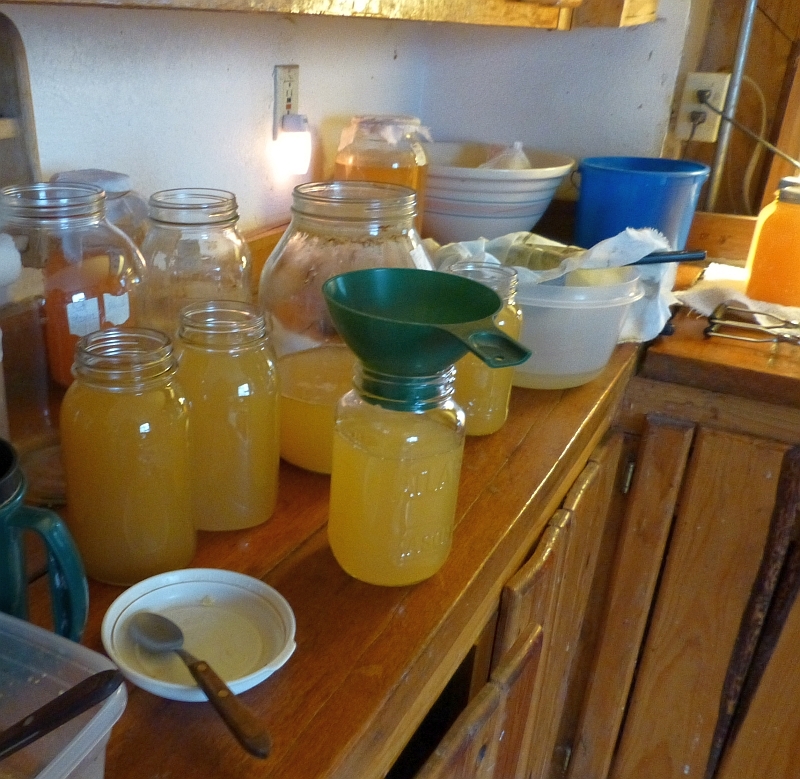 Then I set the different jars of fermented juice on the counter for several weeks, to let them acidify into vinegar. You can see how the different fruits gave slightly different colored vinegar. It smelled lovely. The proto-vinegar formed a scum on top. This is the "mother" and should not be removed. 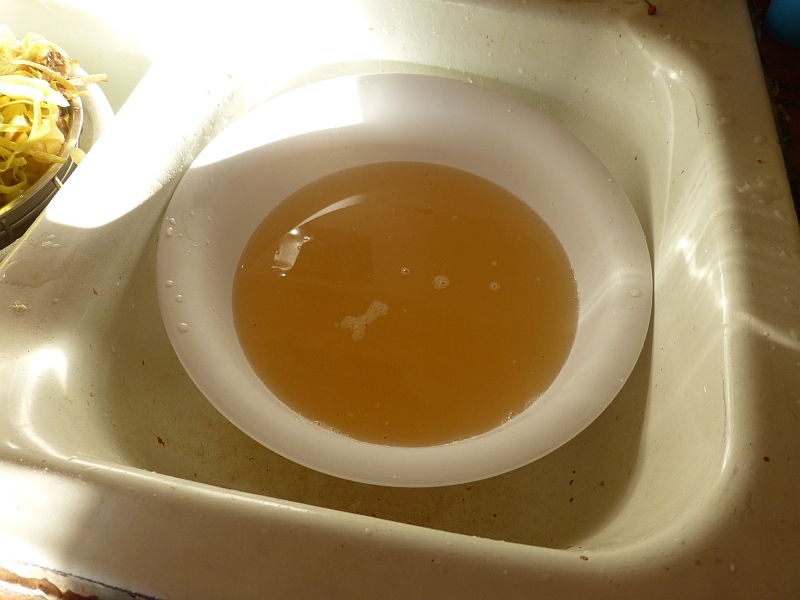 After about three weeks of sitting on the kitchen counter, I decided the vinegar was done. In retrospect I learned I could have let it sit up to six months if I wanted to, though by this point I was tired of those jars cluttering my limited counter space. 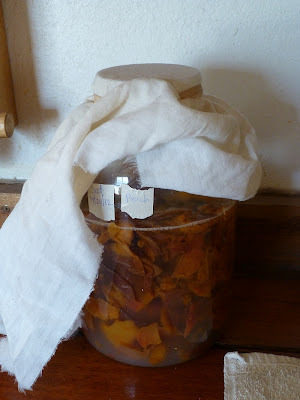 To preserve the vinegar, I could do one of three things: (1) put it in sterile jars and cap with a cork or plastic lid (not metal); (2) pasteurize it using jars with corks or plastic lids; or (3) can it. I decided to can the fruit vinegar to preserve it indefinitely; but the only reason I could do this was because I use plastic Tattler canning lids. 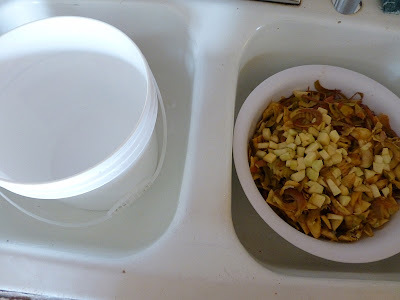 I couldn't use disposable metal lids because the acid in the vinegar would corrode the metal lids after awhile. So I poured the vinegar into quart jars. Can you see the subtle differences in color? 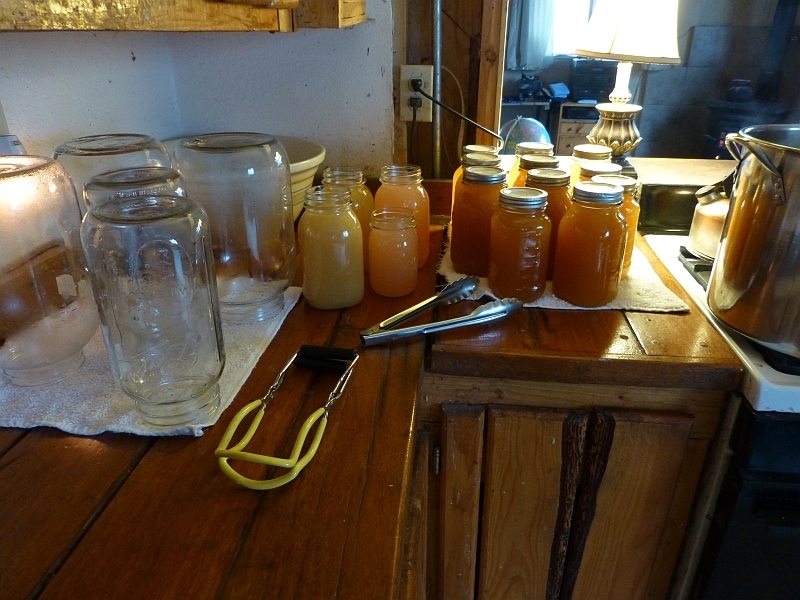 Left to right is apple, pear, and two jars of peach vinegar. Then I canned the vinegar in a water-bath for fifteen minutes. The result: fourteen quarts of beautiful fragrant fruit vinegar. You might call it the ultimate in recycling waste! • Take fruit scraps (peels, cores, bruised unusable fruit, etc) and put in a glass jar, food-grade plastic container, or ceramic crock. Chop up the larger pieces for faster results. • Cover the fruit scraps generously with sugar water. 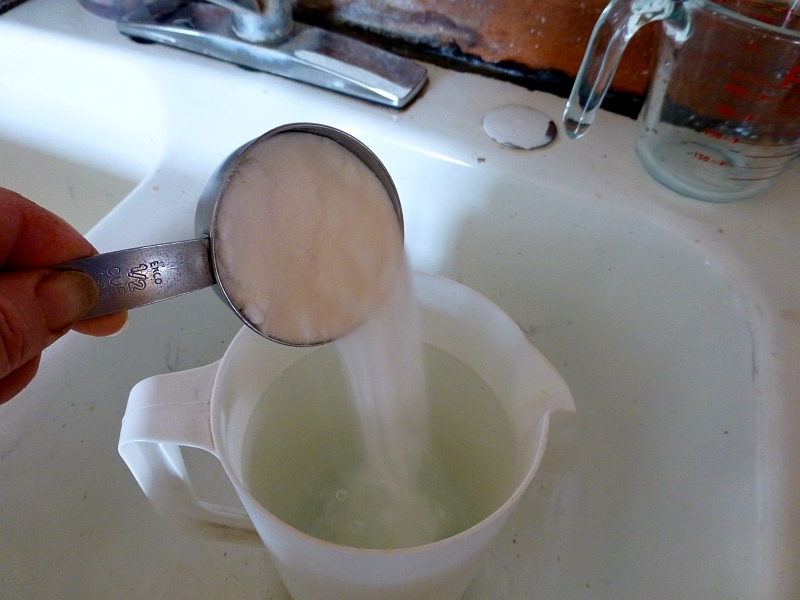 The sugar water should be in a ratio of 1 quart water: ¼ cup sugar. Over time the scraps may swell, so be generous in the amount of sugar water. 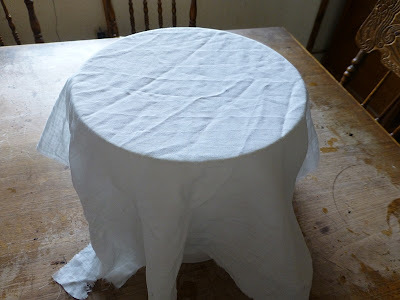 • Cover with cheesecloth or other thin cloth and secure with a rubber band or cord. 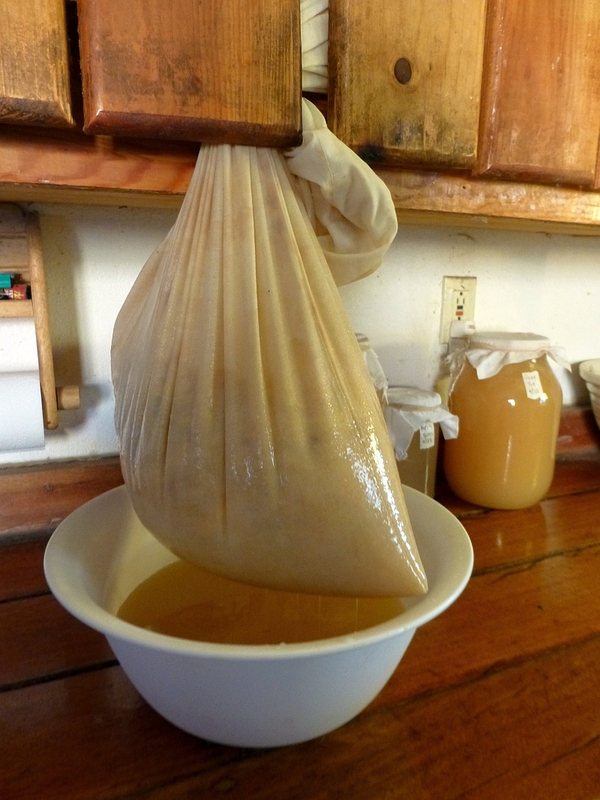 • Allow to ferment for at least two weeks or until the bubbles stop forming. • Strain out the fruit scraps and preserve the juice in a new clean container (glass jars work well). 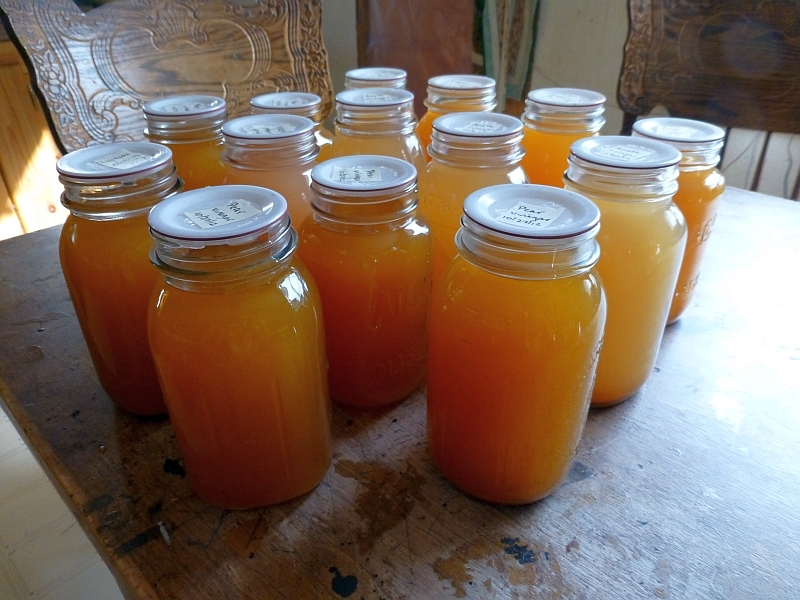 • Allow this fermented juice to acidify for several weeks or even months. 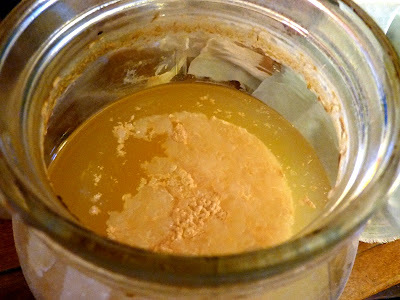 • Strain through several layers of damp cloth into clean sterile jars, and use either a cork or a plastic lid to close the jar. • If desired, pasteurize or even water-bath can the vinegar. • The smaller the fruit waste, the faster the fermentation. While the scraps don’t have to be pulverized, you might want to chop up the really big stuff. 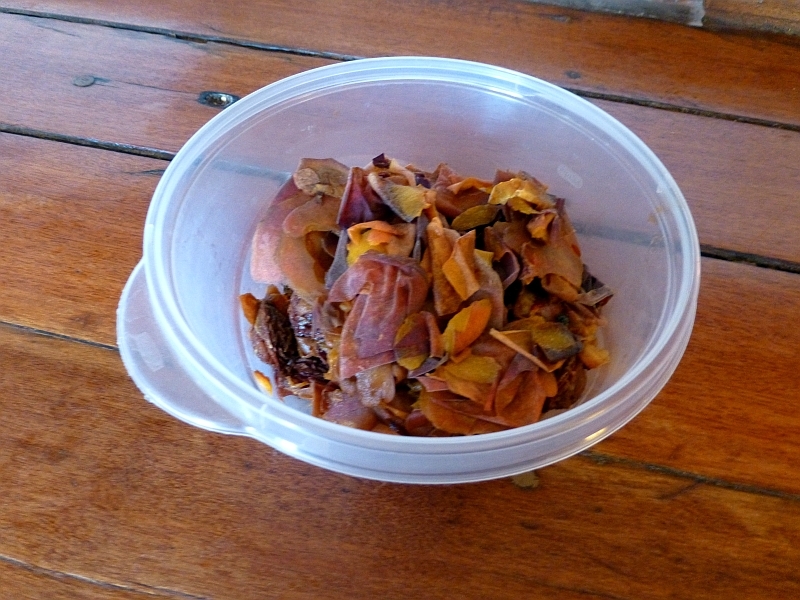 • Oxidized (browned) scraps seem to make a better vinegar than fresh scraps. This isn’t hard to do, as presumably the scraps are sitting by and quietly oxidizing while you’re busy processing the whole fruit. • Do not use metal containers while fermenting the fruit or acidifying the juice. 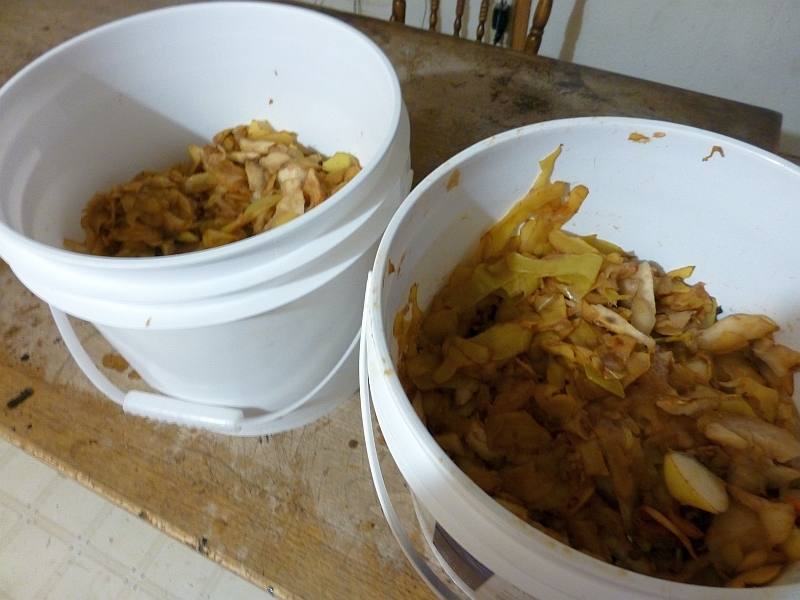 Some people also say you should avoid plastic, but I used plastic bakery buckets during the fermenting stage and had no problems. If you use plastic, it should be food-grade. Glass jars or ceramic crocks are also wonderful. • If your fruit is not organic, it would be best to scrub or wash the fruit before peeling so the peels won’t have pesticide residue during the fermentation process. • The wider the mouth, the more wild bacteria will be captured, and the faster the fermentation process will happen. • If you see a scum forming on top, don’t disturb it; this is the mother. Eventually the mother will sink toward the bottom and continue its work. However if you see mold forming on top, by all means skim that off. Mother isn’t moldy; it’s scummy. • Homemade vinegar should NOT be used for canning pickles or other fermented food. Vinegar for canning needs to be at 5% acidity level, and homemade vinegar varies wildly in its acid content. Even pH test strips cannot accurately gauge proper acidity levels in homemade vinegar. • If you want to speed up the fermentation process, you can add about a cup of Bragg’s Vinegar (or other natural unfiltered vinegar, often found in health food stores) to “seed” the fermenting fruit with mother. You can also purchase “Mother of Vinegar” from such places as Lehmans.com. Making fruit vinegar allows you to utilize the fruits of summer – from beginning to end. Enjoy! So that's how it's done! Thank you, Patrice! You've inspired me to make some fruit vinegars this summer, with which I intend to make the world's most delicious salad dressings! I'm thinking I'll make some with black berries and some with Saskatoons. Seems like you were also along the way to making a brandy/shine: for medicinal purposes of course. That is awesome.... 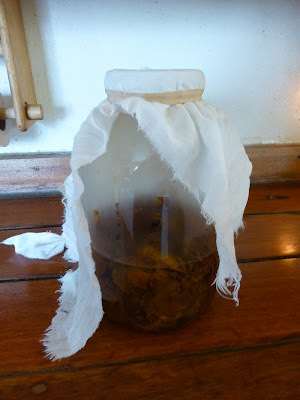 I use Bragg's vinegar and will use it to make some of my very own home brewed vinegar....... THANK YOU!!!!!!! Your process has more steps, but it looks simple enough. Does the hot water bath kill the mother? What can this vinegar be used for? Mostly cooking, whenever vinegar is used as an ingredient. Some people also like to use fruit vinegar as a hair rinse. I put a tablespoon or so per gallon into my chickens watering feeders. And the scraps can still be used on the compost heap - or fed to the chickens...right? Talk about multiple use! I made vinegar from fresh pineapple scrapes a few years ago. I didn't add sugar just let the pineapple ferment in water and then watched as it turned into vinegar. Taste as you go to get an idea of flavor - it's fermented just like sauerkraut so it won't support bad bugs. Tasted like pineapple with a kick. I used it on salads. I'll check out your article and give it a try again. Thanks. This is fantastic! I've wondered if you could make vinegar and now I know. Thank you very much. Can the fermented fruit scraps be fed to the chickens? I wouldn't because the scraps contain alcohol. No one (presumably) wants to see drunk chickens staggering around! I have some apple peels in the freezer. I think I will have to thaw them an try this, it sounds wonderful. I think I'll give this try when apple season rolls around. Thanks for this great post. I'm going to try it! 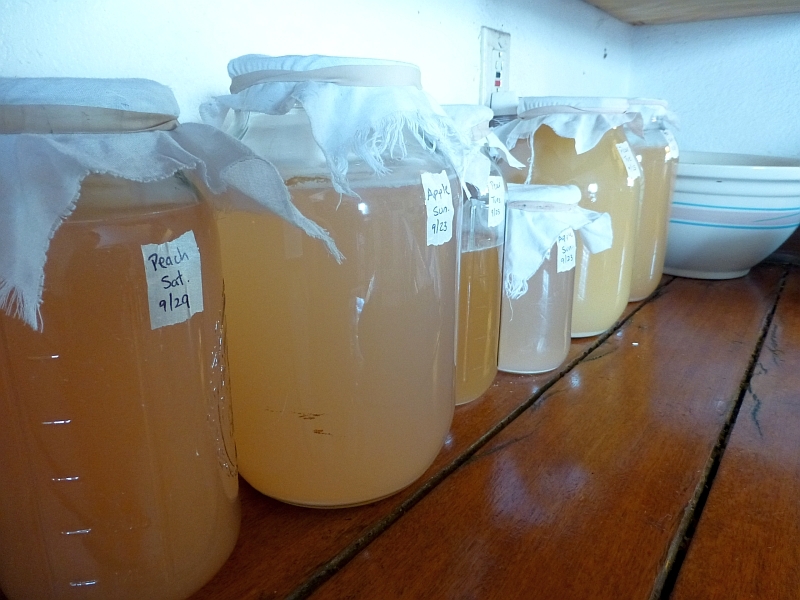 For the fermentation, does the sugar need to be dissolved in the water, or just stirred in? I would say, just stirred in. You should mix the fermenting fruit every day or so (sorry, forgot to add that in) so the sugar will be thoroughly mixed anyway. I have never seen anyone make home made vinegar. Now you know I have to try it. As always, nice explanation. Patricia I will have to try this when canning fruit this summer. On to a different topic--have you ever heard or tried canning italian bread crumbs, much like how you would can nuts in the oven? I ask because I make my own italian crumbs because I don't like buying something so easy when I can make it myself and I usually have plenty of dried bread that I end up feeding the birds with it. Thanks for your great blog and for sharing. Good job. Patricia, I will have to try this when I start canning fruit. On to a different questions (can't find a place on the site other than the comment section of one of your blogs to ask). Have you ever done or heard of canning italian bread crumbs much like you would canning nuts in the oven? I ask because I make my own since it is so simple and can't stand spending money on something I can do myself, but I usually have more than I can use and don't keep a lot of leftovers. I don't know if it will go stale over time, say 3 to 6 months. I don't use anything but dried bread and italian seasoning. Thanks for your great blog, I'm a loyal reader. I've never tried it, but nothing says you can't give it a go. I'll be curious to hear the results, so please let us know! bread crumbs would do fine. Your end result looks fabulous! Don't know if I will ever try it but found it to be most interesting! 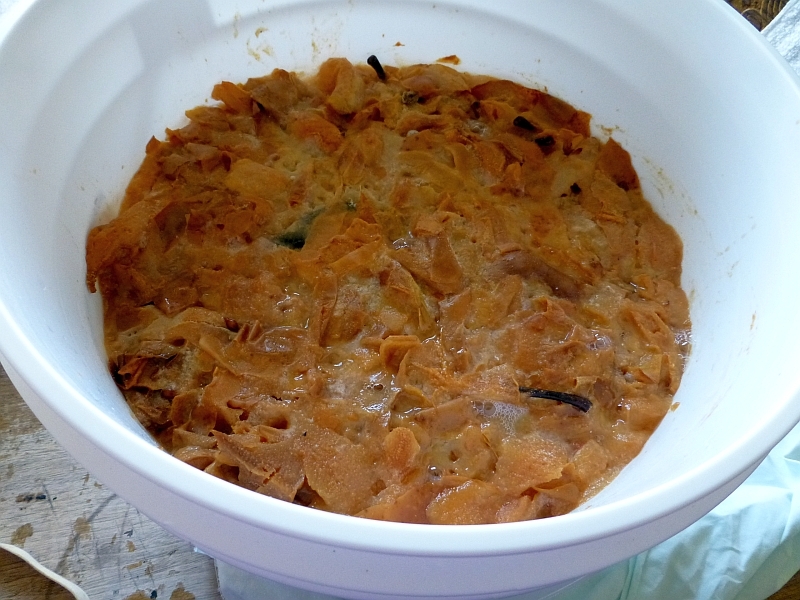 I ferment cabbage and enjoy it very much! Appreciate all you post fascinating and learn so much! 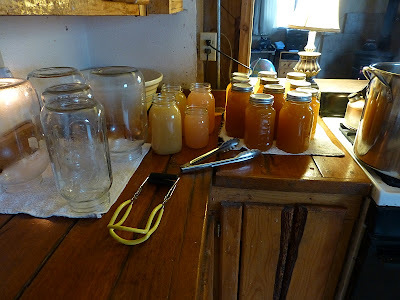 Hi, instead of vinegar with the apple scraps our household cooks and strains them to make Apple butter which is a favorite here. Especially in baking and P & J sandwiches. Did you know that vinegar makes a good weed killer? Use the cheapest find or make, spray the weeds when it won't rain for several days so it won't wash off (I use a little dawn dish soap so that the vinegar will stay on the weed). The theory is that the vinegar burns the weed, and it can't photosencise. think that it harms the environment. 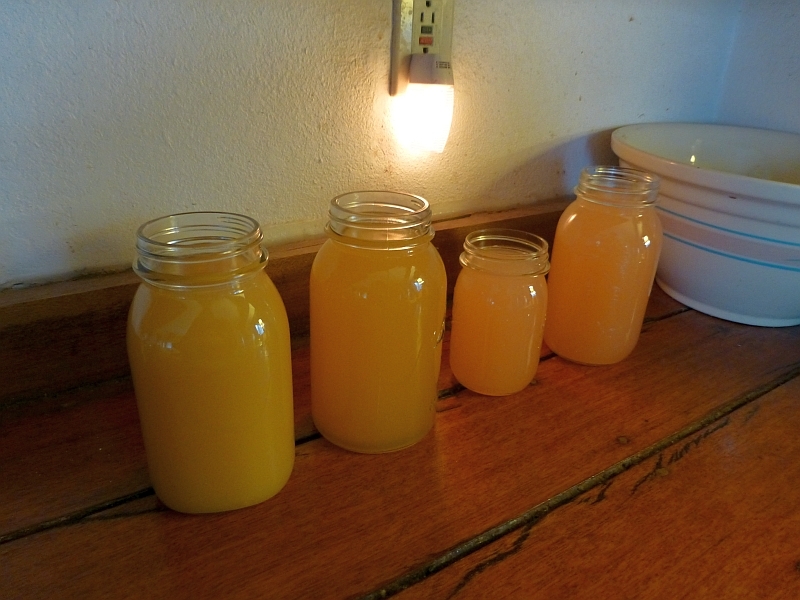 We make apple jelly from our apple scraps. However, I may try to make vinegar next time. Thanks. We didn't make them -- they were in the house when we bought it. But yes, they are hand-made. I have peach and apple working right now. I'm 3 days in and my peach is getting mold on top. Normal or not? Should I try to remove it? Thanks. when making vinegar with peach peelings, can/should I also include the pits? or just chuck them in the fire pit? 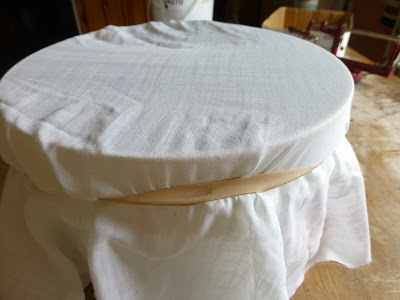 I have two glass jars with lids, do you need the cloth over it or will the lids work just as well? I would use cloth. The vinegar needs to breath. ok thanks, I am about to do something with the apples I got, and this will be a good use for the leftovers. How do you know if you have good bacteria and yeast fermenting your juice vs bad ones? 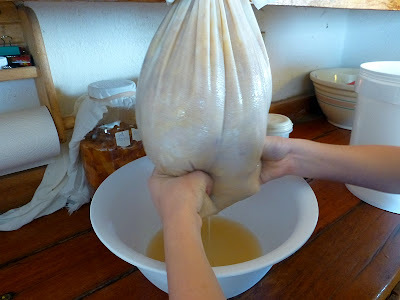 Could you do this with a kombucha SCOBY? If the scum on top is moldy, scrape it off. "Mother" isn't moldy. Most of the time, mother is successfully captured just from air; but if you're concerned, you can order "mother of vinegar" from such places as Lehmans.com. 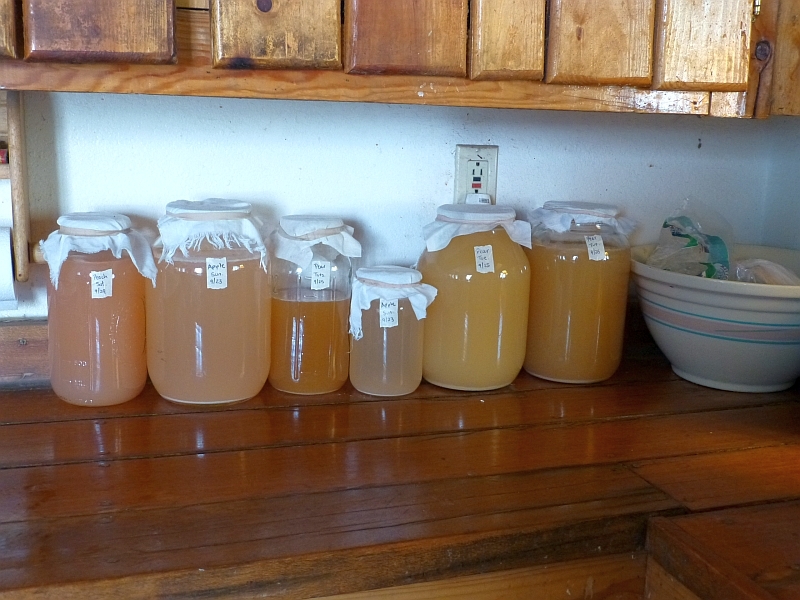 You can also get live-culture vinegars from health food stores, to seed your homemade vinegar. Love it... Can I state FRUIT FLIES........... UGGGGGGG! You are awesome and I am giddy with excitement. My work has a bunch of huckleberries they don't want. It would be excellent for vinegar. Thanks for the inspiration! Can this be done in a crock like kraut? Will grapes work? I'm so excited to try this out!! I'm wondering if this can this be done with grapes? Is it possible to use a crock instead of the plastic food grade bucket? As far as I know, yes to both. A crock should work fine -- just be sure to put a cloth over the top so the fruit can "breathe." As for using grapes, I have no doubt that will work well. It's a short hop from wine to vinegar, after all. The best thing you can do is try it -- and then let us know the results! I love this, I am going to be pressing a batch of apples for juice and expect to have several gallons of pulp left over at the end of the process. Will have to have a go at this. Delete if this ends up going in twice - Loved this. about to have several gallons of pulp from juicing some apples so will give it a go. then have the chemicals from the sugar? You might try honey. The fermenting process requires a sweetener of some sort, and since honey is the oldest natural sweetener out there, my guess is it would work fine. If you try it, let us know how it works out! Thank you, I have enjoyed reading this article online and in Backwoods Home magazine. I just am canning my two batches from August pear peelings. I got 14 pints out of 50 lbs (before peeling). So interesting and easy. Can you use scraps once they have gone through steam juicing or do you need "fresh" scraps? I don't know since I've never done steam juicing, My thoughts are yes, they'll work, but you might need to add some extra sugar water to compensate for the mushy state of the scraps. My advice: try it. If it works, let us know! Loved this post and I have tried to make my own after reading. I successfully made a small jar of apple vinegar and it had a 'typical' looking mother. I am currently ferment pears for vinegar and the mother is very strange looking compared to others I have seen online. It is wrinkly and not one solid lump. I am at about week 6 now but the appearance of the mother has me nervous to use it! If you would like, I have pics over at my place and I would LOVE your feed back. Thanks for your post. 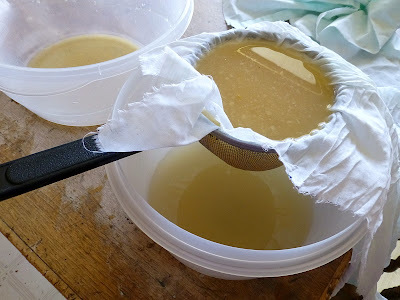 Great info...I accidentally started what like a small batch of pineapple vinegar by leaving fruit scraps in a plastic tupperware container, added a little sugar, 1 week later it smells like vinegar, had some bubbling going on. How do you know when it's ready to drain and start using? Wait until the bubbling stops. 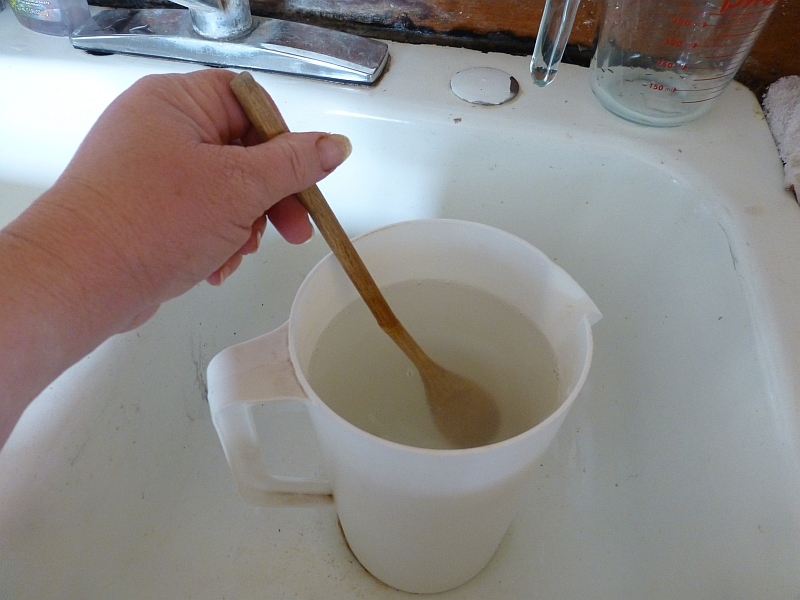 Then drain the liquid, put it in a glass jar, and cover it with a thin cloth (to keep out fruit flies, dust, etc.). It can ferment for a long time, up to six months, before using. I let mine ferment for too short a time and will let it sit longer next time. thanks Patrice, bubbling has stopped, should I let it ferment on the counter or in a dark spot? The counter is fine. It doesn't need darkness. You'll see a scum form. This is the "mother of vinegar" and shouldn't be disturbed (don't skim it off, and don't stir the vinegar as it ferments). You only need to filter off the mother when you're ready to use the vinegar. Thanks again, now i know what to do about that floating stuff on my dads red wine vinegar. Thanks again, and my fathers red wine vinegar is full of floating mother, now i know i can just strain it instead of stirring. Did you leave the mother in your jars, during/after the canning process? No, I strained it out. And if any mother is left in the vinegar, the heat during canning process would destroy it. Can i try with Sugarcane juice? Is there any thing i should add? 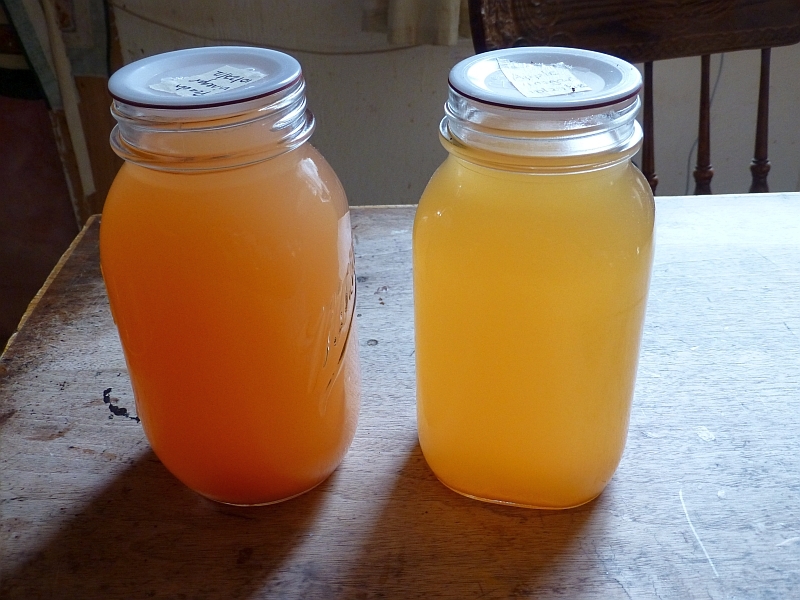 Can i Use Sugarcane juice for making vinegar? 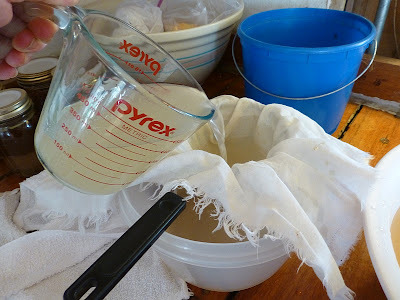 Rather than the flour paste sealant suggested in the link, you might just want to use a glass jar with a cotton cloth rubber-banded around the top to keep out insects. The key ingredient is patience, as vinegar takes several months. Try it and see what happens, then let me know! Can you use other fruits in place of apples in this recipe? I would like to try something like this but have a slight allergy to apples. Yes of course. I made peach, pear, and apple. Others have made pineapple, raspberry, and grape. Pick a fruit and give it a try! 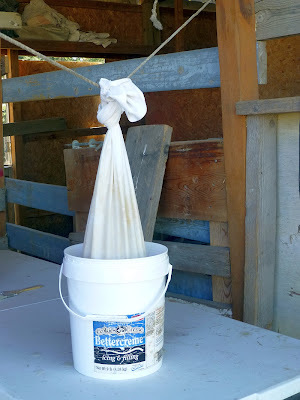 Strain with food-grade paint strainer bags. Much quicker--I speak from experience, and squeezing *does* help if you use them! Currently in the acidifying stage of fig vinegar! I purchase about 30lbs of tart pre-pitted cherries for various projecs every year. I always have a lot of left over juice. Do you think I could ferment the juice by adding some sugar and letting it ferment? I don't see why not. Give it a try and let us know how it works! Since the smaller the pieces the quicker the process, this would probably be great to do with the pulp left after juicing. Can this also work with vegetables, say carrots? Hi! I was wondering, can I use scraps that have been cooked? I quarter my pears and apples, cook them, then use a food mill to separate. Can those cooked skins still work for making vinegar? Thanks! I honestly don't know, but I suspect it's possible. I dipped my peaches in hot water in order to slip the skins, and the heated peels and scraps made fine vinegar. Frankly the only way to know is to try. Let me know how it turns out! Can you use melon scraps, too? Can you use melons, too? I have no idea. Give it a try and let us know what happens! I let a box of peaches that I was going to can set too long (grr so mad at myself). Before I threw them out I smelled a hint of vinegar and wondered if I could possible make homemade vinegar out of them and found your website. I now have some peach vinegar fermenting! 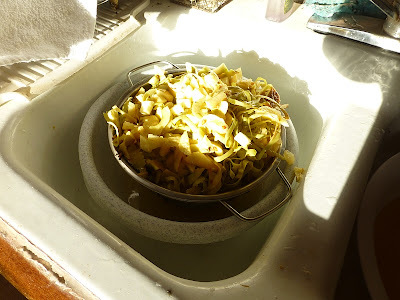 I also use vinegar to clean with (windows and counters) and with all of the fruit scraps we toss I am looking forward to never buying cleaning vinegar again. Yeah! So glad I found your site. I made this vinegar at the beginning of March 2015, and it's been almost exactly 6 months. The problem with my vinegar is that there's only a about 1/4 cup of actual liquid, and the rest is mother. Four thick layers of the mother. It's insane! I don't know what went wrong to have no liquid left and just a bunch of mother layers. So weird. I started out with 1 quart of "vinegar" when I strained the peels, but it seems the vinegar wanted to grow a bunch of mothers, rather than juice. Silly little stuff. I started this vinegar 6 months ago from a similar recipe on the internet. I had a quart of "vinegar" when I first strained it; but over the last 5 months of letting it brew, all it did was create 4 thick layers of mother. I ended up with only 1/4 cup of liquid vinegar. When I first made the vinegar I was afraid it wouldn't grow a mother at all, but it's ended up the opposite. I have more mother than vinegar. LOL Crazy! I'm going to try this again, but I will not let it sit for 6 months this time so I can actually have some liquid left. *grin* I wonder if anyone else has had this happen? Question for you -- Each time a new mother layer formed had the content been disturbed? Do you think your volume of vinegar was decremented thereby? Thank you so much! I h as ve 4 different expiriments growing on my counter right now! Th his is wonderful! 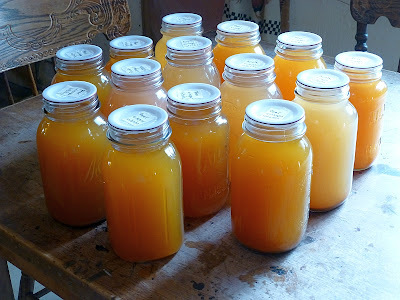 This is first attempt at making ACV using bottled, organic apple juice. Can't find raw ACV, unfiltered where I live. I put the apple juice in a ½ gallon mason jar, and set a flour sack type towel on top. Just checked it after about a week. Looks like the mother is developing just below the surface, but there is black mold on top. Do I scrape this off or do I have to toss and start over? Was my mistake in putting the jar of apple juice in a dark cabinet? And if it can be salvaged, what is the best way to scrape all the mold off while leaving the mother intact (or mostly intact). Thank you. I did some research, and the consensus appears to be if you can't scrape off the mold, then throw away the batch and start again. One of the reasons mold may have developed is the fruit scraps were not completely submerged. I don't know if a dark vs. light environment makes a difference, but next time keep the vinegar in a lighter (though not sun-lit) spot and see if it makes a difference. 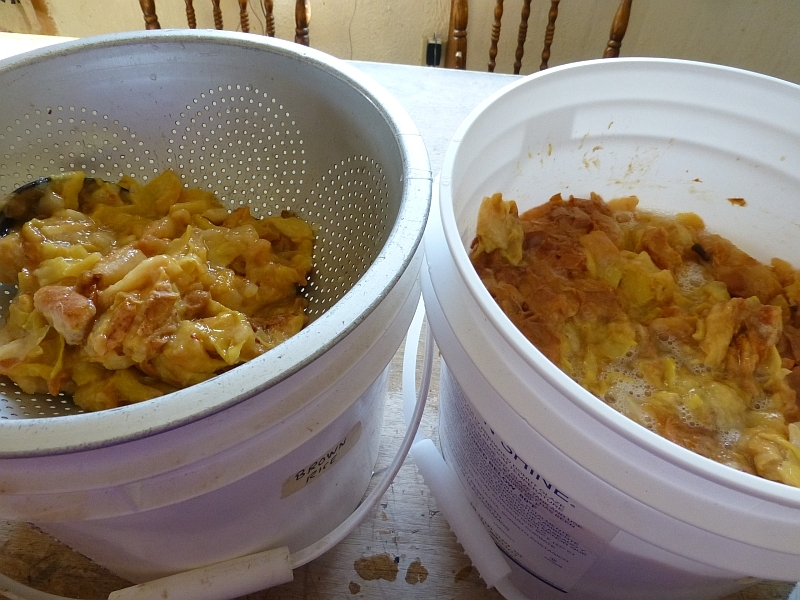 Unless the whole batch of fruit is floating, it might be best to just scoop out the troublesome pieces and let the rest ferment. Alternately, daily stirring should work, if you can keep up with it. Testing vinegar's acid strength is not as difficult as it once was, since there are acid titration kits (much more accurate than pH strips) available at most Winemaker's supply stores. Hi there! Thank you for all your awesome advice! This was great fun and a great success! I have made several different kinds of fruit vinegar - the pineapple was the BEST! 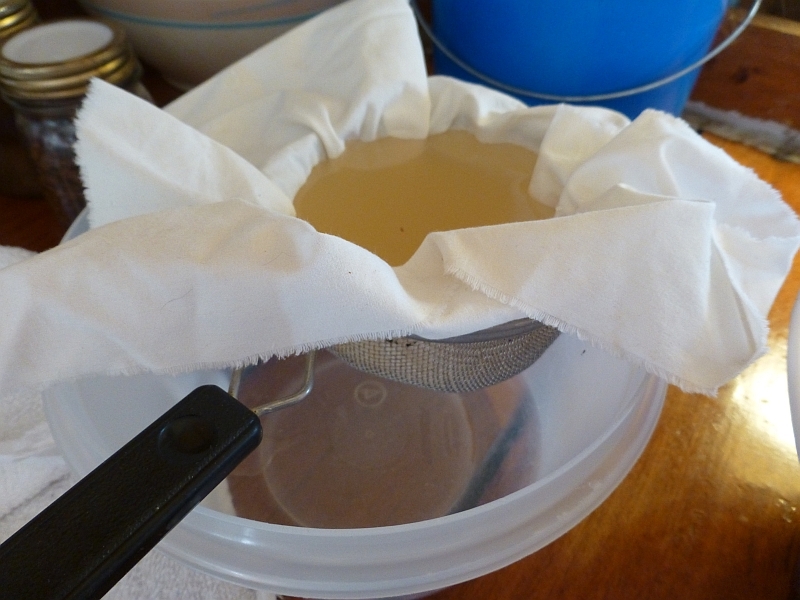 I also grew a BUNCH of scoby which I have passed on and re used. I am wondering if you have ever re used yours and made new batches? I am also wondering if they would transfer over to a kombucha scoby? So man y curious ideas! Looking forward to any experience you can share! Thanks! Do you have to pasteurize it? Or is it ok to just to use immediately. No, it doesn't need to be pasteurized. You should be able to use it immediately. Does the vinegar have to be pastureized? No, I'm sorry, I've never made mustard. I don't see why fruit vinegar wouldn't work, however. Dead weight or worth its weight in gold?